This wasn’t ‘an oversight’, either. We’ve already had a pandering pretty-boy as President. This time, we elected a LEADER. Obama was a big fan of the amorphous ‘international community’. That phrase, of course, can mean literally everything and nothing. Canada’s little princeling (who China hilariously called ‘little potato‘) will of course, be sporting some sort of ‘post-national‘ socks for the occsasion. And everyone was given some ‘swag’ to wear for the occasion. You can see it on their lapels. The G20 Pin. 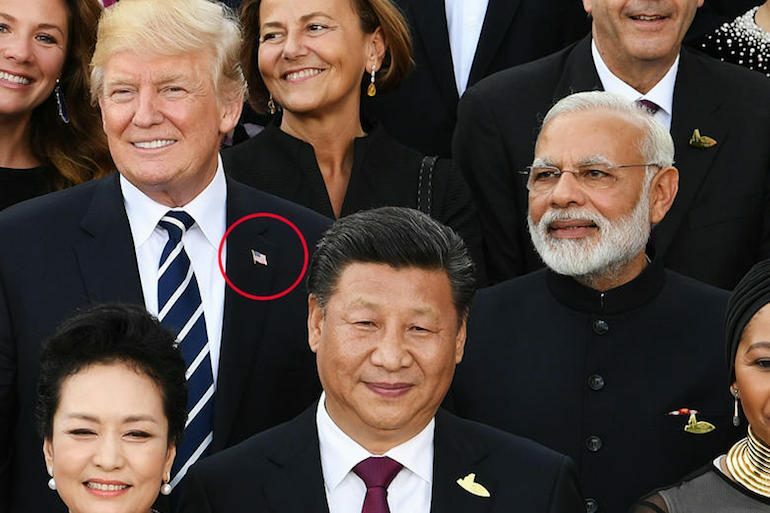 Wait a sec, you can’t see it on Trump’s lapel. He’s already wearing something on his. Yes… it’s the American flag. That, ladies and gentlemen, is YOUR president. That was what MAGA was all about. Share if it’s nice to have a President who actually loves America again. Watch: Helicopter Attempts To Bring Bride To Groom At Wedding – All Hell Breaks Loose!